Lee Haney is an 8x Mr. Olympia champion, a record that is shared with Ronnie Coleman as the great amounts of Sandow trophies. Lee made a big splash in the sport at an early age and really created a new trend to the sport in the mid 80's. Here is a direct example of Lee's 1991 Mr. Olympia contest prep diet. See if it can work for you as well. Meal 1 - 2 whole eggs, 6 egg whites, 1 cup cooked oatmeal, pineapple, coffee. Meal 2 - (post workout) 2 chicken breasts, spinach, pineapple, 1 baked potato. Meal 3 - whole-wheat pancakes, coffee. Meal 4 - 2 chicken breasts, green vegetables, brown rice, pineapple. Meal 5 - 1 cup cooked oatmeal with fruits. 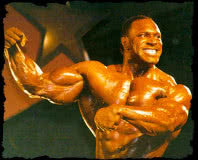 Haney always aimed to develop mass with quality, always keep everything in a perfect balance. He often combined push and pull exercises and was a firm believer in the pyramid set principle. Always stay focused from start to finish. Here is Lee's basic workout summary.